I wish there was more GOP interest when I raised the same issue during the Bush administration, where they audited a progressive church in my district in what looked like a very selective way. I found only one Republican that would join me in calling for an investigation during the Bush Administration. I'm glad now that the GOP has found interest in this issue and it ought to be a bipartisan concern. If Schiff longs for bipartisan cooperation, he better hurry. When, as Seitz-Wald points out, the Bush 43 Administration went after liberal All Saints Episcopal Church in Padadena, Greenpeace, and the NAACP, there was nary a concern expressed by Republicans. 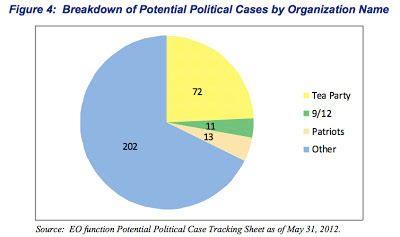 When the ruling in Citizens United inspired a doubling of hard ideological groups- most of them conservative- pretending to educate the public about public policy and registering as 501(c)(4), the GOP was predictably silent. Not surprisingly, even media darlings such as Marco Rubio and Chris Christie raised no complaint, thereby enhancing their image in the Village. There is only about a year until posturing begins for the 2016 presidential race, at which time the GOP no longer even pretend it cares about reform. If a Repub President takes over in January, 2017, the only only interest of his/her party interest his/her party in the IRS will be an urge to eliminate. Blame, though, lies not only with the party which exists to further corporate dominance over the middle and lower classes, but also with the Democratic Party, whose voices prior to the current scandal included Schiff and too few others. Even now, Democratic outrage is centered on alleged targeting of conservative groups, none of which- so far as we know- has had its tax-free status revoked, notwithstanding their overt political activities. The shortcuts taken by the Cincinnatti (and possibly other) offices of the IRS derived far less from ideological bias than from pragmatism. The IRS budget is down, David Cay Johnston reports, 17%-20% in real terms since 2002. The range of functions it is required to perform have increased. Further, in 2012 its Exempt Organizations division processed 2,774 tax exemption applications, compared to 1,777 in 2011 and 1,741 in 2010. This trend is not limited to the Internal Revenue Service. Available revenue varies significantly from jurisdiction to jurisdiction. But most government employees across the country would confirm (were anyone interested in asking) that the tasks their agency is expected to perform, and the duties they individually are assigned, have increased substantially in recent years. And this demand on their time has expanded often with declining budgets. Government workers everywhere have resorted to "short cuts," as exempt organizations director Lois Lerner described the approach apparently taken in the Cincinnatti office. Republicans, obviously, will not tell us this. Neither will President Obama, who yet dreams of a Grand Bargain, and who has responded to the scandal by successfully soliciting the resignation of the acting director of the IRS, though the agency was headed during most of this period by Bush appointee Douglas Shulman. Neither will the GOP nor President Obama inform us that the greatest sin committed was harassment of small groups The IRS made sure not to mess with the big boys- politically aggressive groups such as the pro-Obama Priorities USA, Karl Rove's Crossroads GPS, and the Koch Brothers' Americans for Prosperity, which have vast legal resources. They have been allowed to maintain the fiction that they operate as "social welfare"organizations, and so maintain their tax-exempt status as 501(c)(4). Good luck to Adam Schiff and the few members of Congress who would like to protect the interests of the American public and voter and bring a sense of fairness to the IRS. There was, once upon a time, an organization targeted by the Republican Party and which the Democratic Party was afraid to defend. Its name was ACORN and, through GOP disinformation and a combination of Democratic ignorance and cowardice, it was legislated out of existence.